I first look over the egg, and make sure that the wax has been pretty much removed. If there are still large areas of wax, I will usually send the student back to finish removing it, if they seem capable. If there is still a little, or it is a very young student, I will use my candle to remove any remaining wax. Once the wax has been mostly removed, I will clean the egg with a solvent. I generally use mineral spirits, on a tissue or soft paper towel (e.g. Viva), and will gently rub the egg. (I don’t allow the students to do this because most such solvents are quite flammable and shouldn’t be inhaled.) This should remove any residual wax and soot. 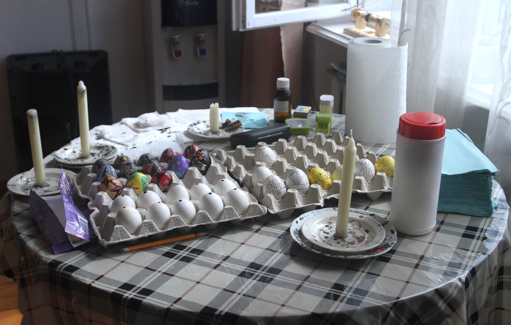 If I will be taking the pysanka home to varnish, I place it safely in an egg carton for transportation to my house. If the the will be going home directly with the participant, and will place a small dab of Vaseline (petroleum jelly) on the egg and roll it in my hand to coat it thinly and evenly. I’ll then use a soft paper towel to rub the pysanka and remove the excess. This provides a nice sheen to the egg (as on the pysanky below), and should protect it against water damage. It will be placed into a secure egg carton until it is time to go home. I keep all the finished pysanky in a secure/closed egg carton, or an egg flat in a safe location, until the end of class. 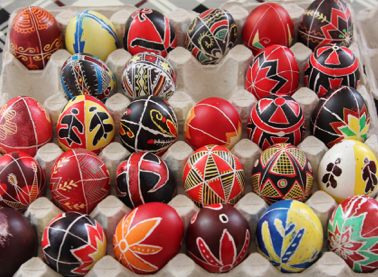 Some students write more than one pysanka, and this decreases the risk of their finished egg rolling to the floor and breaking while they are working on another one.